A 21-year-old man suffering from a rare disease that has caused his belly to swelled up to the size of a beach ball hasn’t been able to sleep properly in the past five years. 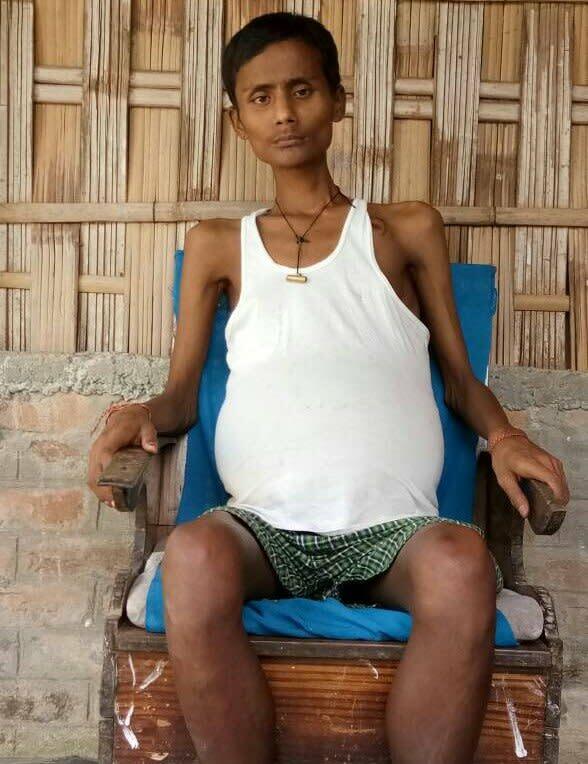 Bikash Hazarika, from Dibrugarh district in Assam was a football player until five years ago, is unable to sit or sleep because of Hirschsprung's disease - a build-up of faeces inside his bowel.He his in a critical state, he can't even walk properly. He depends upon a heavy dose of medicine that ensure his urination happens conveniently. Hazarika visited four hospitals looking for a cure for his infirmity before approaching Assam Medical College (AMC) in Dibrugarh Assam. Some doctors say he has been suffering from congestive hepatomegaly with ascites for the last nine years. “In 2009, while playing football with my friends, I became breathless suddenly and collapsed to the ground. As I used to become breathless frequently after that, three months later I went to the local doctor for treatment. The doctor suggested that I should go to the government hospital at Dibrugarh. At the Dibrugarh Assam Medical College Hospital, the doctors told me that I had had a heart attack sometime back and due to that my heart beat rate has slowed down. 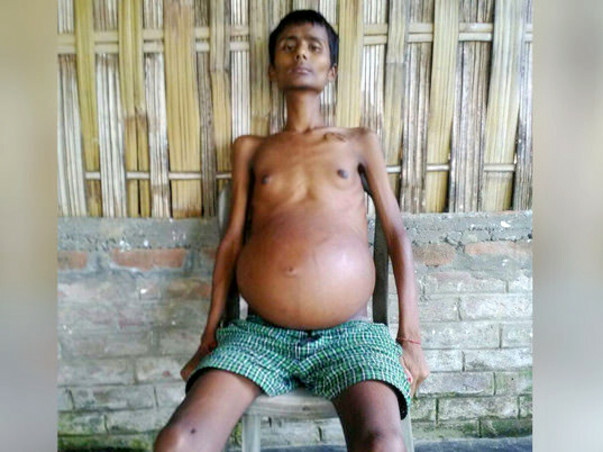 The doctor said that a pacemaker had to be placed inside my chest to help control the abnormal heart rhythms, otherwise I would not survive much longer, says Bikash. The pacemaker device was placed inside his body the same year. One month after the pacemaker was placed, another medical problem arose. 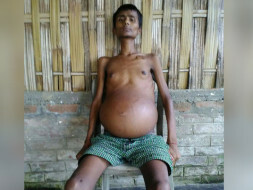 Fluid started collecting in his body, and stomach started bloating abnormally. “Since then I am having problem in walking and breathing. In 2012, this pacemaker was replaced by another one. For the last several years, I have not slept lying down, but can only sleep in a sitting position that too for a small duration — say one and a half hours only. Also I find it very difficult to relieve myself. Though I played a lot of football in my school days, and would love to ply it even now, I am unable to do so due to my medical issues,” he says. The doctors had advised him to undergo a surgery, but his family hasn’t been able to organise the funds required for the treatment. Moved by the plight of the family, people have started donating whatever they can. But since the neighborhood where the family lives is also very poor, the amount pooled is much less. The family has tried to reach out to the government authorities for help, but they haven’t heard back from them as yet. Bikash's friends and neighbours have started an initiative to raise funds for him. "We have managed to raise some funds for Bikash, but that's too little," said Manas Jyothi Bhuyan. "That's why I have set up a fund raising campaign in Milaap (India's version of GoFundMe). 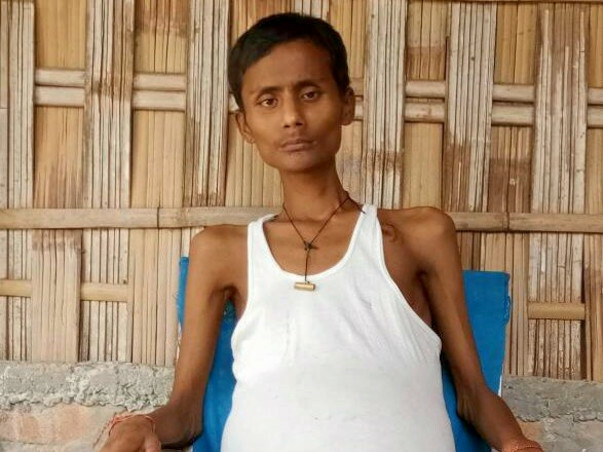 The idea is to reach out to more and more people and get help for Bikash as the state has failed him and his family cannot afford his treatment." Many of Bikash's childhood friends have started doing job and are married. But for this 21-year-old, isolation is his company. He used to have a lot of friends earlier but after this medical condition hit him, Bikash's seems to have gradually giving up on himself. "I don't know why I am condemned with such a miserable life. Until 2009, I was leading a normal life. But then everything went haywire. With every passing day, something is dying inside me. The hope that I can get back to leading a normal life is fading away. I appeal to you, generous souls out there to pitch in with whatever you can, so that we can organize the funds required for the treatment. 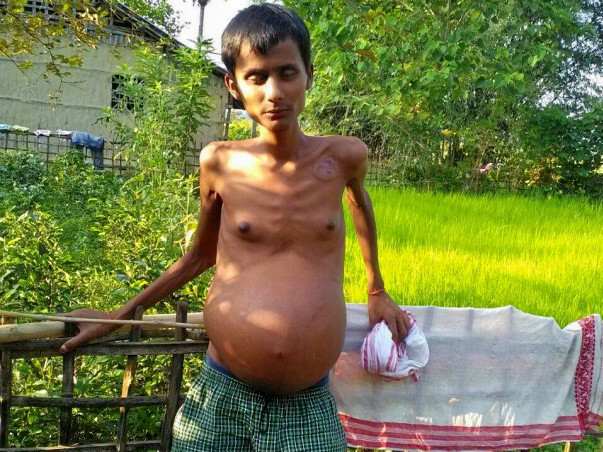 Those of you cannot pay, just pray for me that I will be a great help, too,” said Bikash.